My engagement was very much unplanned. When my husband and his family came on that day, my family only expects the event to be a discussion between my parents and his parents. I did not expect to become engaged whatsoever on that day. Well,if according to the islamic teachings i've already become engaged to him from the moment i I've agreed to marry him. I was really nervous that day as i was meeting his parents for the first time and him for the second time. My head was spinning when suddenly my father said, " my wife and I have no objections to that suggestion. However we need to ask the person in topic herself." Confused, I answered," if both my parents have no objections than i too will not object. I will just follow whatever they've decided." Hearing my answer, his mother (aka my mother in law now) stood and pulled out a ring out her handbag. I was taken back a little as i was not expecting it and before i know it i've already given her my right hand and she slipped the ring into my ring finger. And it fits! I was blushing so much that i dont dare look anyone in the eye at that time. Luckily my dad saved me from dying of embarrassment by announcing that it is time for lunch. My mother got up and turned for the kitchen and seeing that I quickly got up too and almost ran behind my mother. But I didn't go to the kitchen. Instead I went into my sister's room where all my other sisters are waiting for firsthand stories of what has happened. I stayed in the room until my fiance and his family was leaving. Only then I went out, and before he stepped out of the door, my fiance announced that he has prepared a gift for me, which was a book written by Ustazah Fatimah Syarha - Sebarkan cinta-Mu. 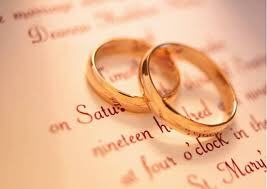 My wedding ring is another story that I would never forget. We never went together to the jewellery shop to buy one so he asked me about my ring size and I told him, "Ask you mum because the engagement ring the other day fits." The truth is that I also don't know my ring size because I've never worn a ring before. 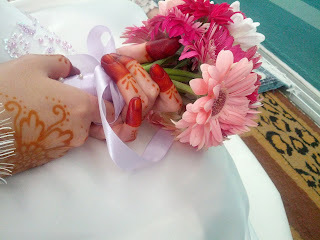 On our wedding day, both of us were really nervous when we finally saw each other after the solemnization. He was escorted by my brother in law towards me to hand me the dowry. As he sat down in front of me, I was so nervous that I could not look at him in the eye. After he handed to me the dowry, it was time for him to put the ring on my finger. His hands were cold when he took my fingers and as he tried to slip the ring in, it got stucked in the middle of my finger. I heard his nervous voice said, "It doesn't fit. Can we try putting it on another finger?" I imagined him trying to put the ring on my little finger which would be hilarious and I frantically said, "No,no it can fit." and helped him pushed the ring into my finger. Well, actually the ring really fits. It's just that he was really2 nervous and when it got a little bit stucked he freaked. Now, when we talk about this incident again, we would both laugh thinking about how nervous we were on the day of our wedding. With 2 rings, we were tied in a promise. A promise to be together till jannah, inshaAllah. May Allah bless our marriage. Amin! I made my own hand bouquet for my wedding to save on cost. The bridal package that i rented only provides artificial ones. The cost to have a fresh flower hand bouquet was around rm100 and so I decided to make my own. I swapped a few things (ie the hand bouquet, veil, and shoes) that I didnt want to rent from the boutique but are included in the package with 2 White cushions for the solemnisation ceremony. So, how to make you own bridal bouquet? It is so easy and simple and it's much, much cheaper too. The overall cost of my own bridal bouquet is only around RM 30. I bought the beautiful daisies from the morning market in chow kit. There's a stall that sells fresh flowers at quite reasonable prices. If I'm not mistaken, each stalk was sold at rm 1.50. 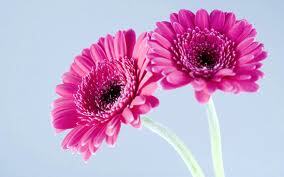 So i bought 8 pink and dark purple daisies to match my wedding theme. 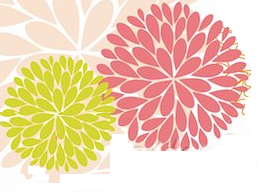 It is advisable that you buy the flowers one day before your wedding day, if you are doing it yourself, or the morning of your wedding day if you could have someone to help you with. 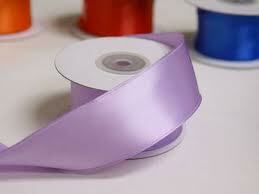 The satin ribbon that I used is lavender in colour. I loved it so much as it is exactly the colour that I wanted. I bought it at a shop in Seremban (while shopping for other wedding things) at about rm 2.50. This is a video that has helped me in making the hand bouquet.. 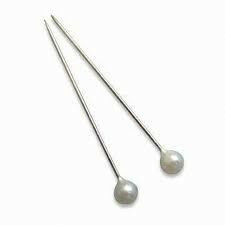 In this video, she does not use any pins. 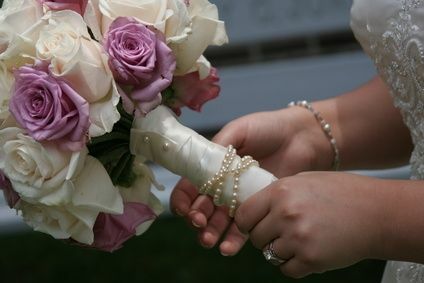 But if you want to make your hand bouquet looks much exclusive you can add up the pearl pins. I don't have pictures of my own bridal bouquet to show (forgot to take pictures of it amidst the nervousness of getting married) but these are few pictures that have inspired me. Really love the combination of cream and lilac. And the pearls make the bouquet looks really exclusive. Have fun trying and happy saving! It has been 16 days since we've been married. We are one those couples who had to experience the sweet and bitter of long-distance marriage. It's hard but we keep on praying to Allah to strengthen our hearts and bless this marriage. Oh, Allah. Please fill our marriage with sakinah, mawaddah wa rahmah. There's a lot to update but I've already started working and it has been really busy for me. InshaAllah, will update when I have the time. One of my friends once asked me how do I feel about getting married. How do I know whether I am ready or not to carry the responsibility of being a wife? And her last question was, when will it be her turn? To her first two questions I honestly answered that up until today I don't know whether I am ready or not to be a wife. I am really nervous and also scared at the same time. The idea of marrying someone that I just know is really terrifying. I only met my fiance 3 times throughout this 5 months we've been engaged and all 3 times are in the presence of my parents. I am scared but I keep on praying to Allah that if he is destined to be my husband, if he is the one He has chosen for me, please guide me, please give me strength and please give me peace in my heart to accept him. 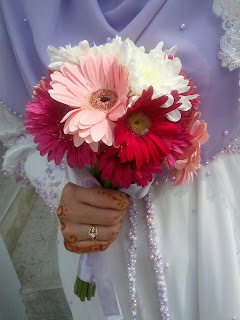 Up until today, despite of all my uneasiness and reluctance, Allah has so far made all my wedding plans easy.. inshaAllah.. The truth is that in life you can never be ready. But eventhough you can't be ready, but you can surely be prepared. To her other question, some of us might have also been wondering about the same thing. When will it be my turn? To my friend I answered, do not become too focused on wondering when will it be your turn, because the only one who knows that answer is Allah alone. Keep on praying for the best and always remember that good things take time. I always tell myself that when Allah has seen that you are ready, He will surely send you the right person right away. But if you feel like you are ready but the right person has still yet to surface, perhaps that person is still in the process of tarbiyyah so that he/she can be the best spouse for you, in this life and in jannah. It has been quite some time since I last post in here..
Been busy working. My laptop has been peacefully resting in my closet for the past 1 month. I hope one day when I have the time to turn in on, it will still be functioning. Today, my maid of honour whom I'm sharing a room with in the quarters of my workplace offered to help me design my own wedding invitation card. Well, I have to tell you that, I am not very good at designing things digitally, watching her work her magic makes me feel really amazed. Why do I choose to design my own invitation card? Well, the truth is I don't really mind if the card is not expensive. What matters most to me is that the card can be useful. Because after the date of my wedding passed, people would be throwing it away anyway. Why waste on something that other people would throw away? However, the other day, my mother and I went to a local shop in our housing area. This shop is owned by the daughter of one of my mom's friends. So mom suggested for me to get my cards printed in her shop to help her business. The shop owner told me that if I design my own card, I could get a nice card according to my taste and it would be cheaper, just around 60 cent per piece. A full coloured card. And since the shop is very near to my house, it will also cut the cost for delivery or transportation. So, today the design for my invitation card has already finished. And I love it! I totally couldn't have imagined that I could get a card based on the design that I wanted, until today. I've been surfing the internet dozen of times searching for the one that I like and couldn't be satisfied. But now, I am very happy to have a card with the design that I like at a cheaper cost. Just got back from induction program for 4 days and 3 nights. pheww.. I got the hospital that I applied for, Alhamdulillah.. But after I got the letter, I realised that my wedding date might clash with the duration of my tag of the 2nd posting. FIY, for housemen working in government hospitals in Malaysia we need to undergo 2 weeks of tagging.. It's not that I can't apply for leave during that date. It will be difficult but it can be done, inshaAllah..
My main problem is that, none of my friends would be able to attend my wedding if that happens! Because they would also be doing their tagging rotation. And giving excuse such as wanting to attend a friend's wedding wouldn't be such a strong one to put in into the application form, would it? Erghh.. I don't know what to do right now..
Have to wait until monday so that I could confirm the rotation schedule and then I would have to call to adjust the booking date of the hall..
Pray that everything would be at ease, InshaAllah..
4) Tempat nak akad nikah.. rumah ke masjid? masing-masing ade pros and cons dia.. untuk majlis akad nikah, ingat nak sewa bantal nikah dengan bridal shop je.. Tp my mum nk guna tok punya.. (risau sbb elok lg ke bantalnye???). Tak perlu mic untuk akad nnt.. buat menambah nervous bakal suami jek.. kalau kat rumah, nak pelamin ke? Tp hanya utk akad nikah je rasa cam tak berbaloi je..
Apa lagi ye..? Rasa macam banyak lagi benda yang belum selesai..
p/s: sorang-sorang je plan wedding sendiri..
p/p/s: only a few months left for preparation and I'm starting work soon so I don't know how I'm going to continue my preparation afterwards. Have to make use of any holidays that I earn. A common girl, with a big dream..